This post is part of a series in which ladies on the road offer a review of their backpack. Today’s review is from Allison Suter who has traveled around the world (twice!) and has big plans on the horizon. Hi! I’m Allison Suter! I’m a 29-year old former lawyer and current wedding and portrait photographer from Canada with 2 career breaks behind me and a lifestyle redesign project starting as we speak! I’ve been to 53 countries in my 29 years on earth. I visited most of those countries in a 6-month solo round-the-world trip in 2004 and a year-long round-the-world trip with the guy who is now my husband in 2008/2009. In January, my husband and I are going to spend about 3-months in Buenos Aires; while there are going to try to get a last-minute cruise to Antarctica to get to the last continent before both of our 30th birthdays! I have a 60L Gregory Deva. In Canada, it usually costs about $280. I got this backpack in 2008 before my last RTW. I’ve travelled through the Middle-East, parts of Mediterranean Europe, Africa, Japan, Australia, New Zealand and South America with this pack. I used to travel with the predecessor to the quintessentially Canadian MEC Walkabout Pack. 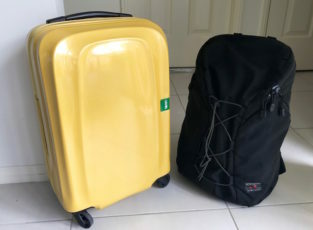 I loved that the pack opened up like a suitcase, but I had two main problems with it: 1) most of the day pack capacity was lost when zipped onto the main pack, and 2) it was not a comfortable bag to carry. So, for the 2008 trip, I decided that I wanted a new pack that was very, very comfortable; it also needed to be big enough to carry a sleeping bag, sleeping pad, and half a tent (we camped through parts of Europe and Africa). I tried on several bags and when I was able to carry 60lbs through MEC for 20 minutes with the Gregory Deva bag on my back, I knew I had found “the one”. Despite being more money than I wanted to spend, it had too many pros to resist! Not only comfortable, this bag also has lots of organization and despite being a top loader, you could get in through a mid-zipper compartment AND through the bottom. Combined with Onsight Mesh Organizer bags in small, this bag had it all. The reason I picked the bag (its comfort) is still the thing I like most. I like the organization (side pockets for socks and undies; other side pocket for bits and bobs I need to access), bottom section for tent & sleeping gear, top pocket for rain jacket and shoes, middle zip access for my mesh bags that hold my clothes, front pockets for other quick access bits and bobs, and the remaining space for shoes and books. Now, a few things have changed since 2008. First, my Kindle. I now no longer need to haul 8 books at a time (I wish I was exaggerating, but I’m not… I’m a big reader who never likes to be without a book). Second, no tent. I’m a little worried this bag is going to be cavernous now! The last con is the price. It’s quite expensive. But I don’t regret spending the money on a bag that is so easy to carry. This is a women’s bag, and you can tell. I have the XS size, so it is actually 58L. It fits me perfectly. I really recommend going in and getting fitted for your bag if you are going to be carrying it for long distances or using it for any hiking. I hiked the Inca Trail with my (less than half full bag) and it was perfect. Nope. Well… maybe if it was only half full. Don’t count on it though! With the tent: just right. Once we sent the tent home as planned half way through: a little too big, but it compressed. Now without books: positively cavernous. But, I really really don’t pack many clothes or shoes when I travel! If you need the space and you are going to be walking a lot with your bag, absolutely. If you travel lightly and/or slowly, probably not! If I decide to invest in a smaller bag (after this three month experiment with all the extra space), I’ll probably spend the big bucks and get a smaller technical hiking bag. I bought a cheap raincover for my bag, I use it when flying to pack up my bag so all the straps don’t get eaten up. It only weighs a couple of ounces, barely takes any space, and saves me grief from check in agents. Bonus: it’s awesome to have if it rains! Allison, thanks for telling us about your experiences with your backpack. Best wishes to you and your husband as you venture to Buenos Aires, Antarctica, and everything life has in store for your next! Learn more about Allison on her photography site allisonsuterphotography.com and travel blog ihopecheetahsdonteatus.com and connect with her on Twitter @apsuter. >> Check out Laura Walker’s review of her Gregory Diva 60L pack. >>Read about more women’s travel backpacks here. Just wondering what daypack you used while carrying it on your front and the Deva pack on your back. I’m looking for one to fir my 15 inch laptop, plus other accessories. What dayback are you using in your picture? Love it!